(Part 4 of 7) Photographer Matthieu Paley travels to the Hunza Valley in northern Pakistan where evening meals are a celebration not to be missed, with an assortment of chai and capatis sprinkled with apricot oil. I went to look at how people survive living in the lower valleys in the deep valley of the Himalaya. And, so I went to Pakistan, the area called Hunza in Northern Pakistan, bordering with China to the right and Afghanistan, the Wakhan Corridor. We are down below where people can actually grow, have agriculture. Subsistence agriculture, it's very difficult. It's a harsh environment, you need hard work in order to grow anything. The Burusho, they are also called Hunzakuts, they are the people of Hunza. And there is about 80,000 or so of Burusho. They speak their own language which nobody really knows where it comes from. The only link they found with that language was in the Basque Country. Imagine the connection, it's just incredible. Nobody knows. So, subsistence agriculture. This is Samhina tending to a potato field below the Altit Fort, over 1,000-year old fort. Down below is the Hunza River, 1500-feet below. And so this is subsistence agriculture. You find any land possible to grow. Potato since fairly recently. And the village right behind, fortified villages often for cold, for protection. It's part of the old Silk Road. There used to be lots of raids traditionally from caravans. And so they live in a very strong community atmosphere because of this closeness they have. And if we go into that house that is up there you know, you walk into this kind of beautiful scene. So this is life in Hunza indoor. Very simple kitchen . 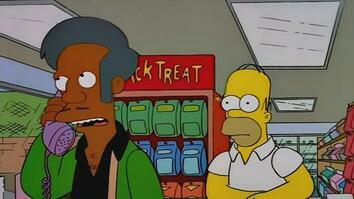 And then you get offered tea like anywhere there, salted tea. So, this rock, you see that it's rock salt. So you get-- pour your milk tea and you take the rock and use it to stir your milk, your tea in there and it will give salt to your tea. You know, traditionally salt is, has always been fairly easily accessible. You can find areas with this rock salt. But sugar is not part of the, you know, traditionally their diet. It's just... it needs to come from far away. 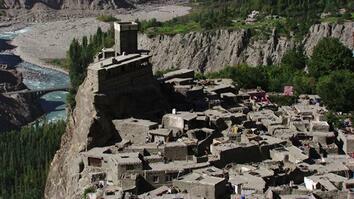 This village you saw is really Hunza, is Central Hunza. I wanted to go a bit further to really walk away as much as possible from market food. So we went further north towards the border with China over this lake that was formed by a huge avalanche in January 2011, I think. And now we have the 30-miles and about a mile deep lake that was formed by this whole mountain that fell in the valley basically in the Hunza Valley. So, in winter it means crossing with a boat. The lake receded a little bit in winter and left this carcass of a boat which was quite surreal in the mountains to see that. If you look down while you drive after you've left the boat you see the Hunza River and you see this hanging bridge and often there's people walking on them. They are going from the village to the pastures. Both in winter and in summer they go to the pastures. I don't know if you can see but there's about this gap between each step on the bridge, with the wind it's often moving. And you get this 60-year old grandma you know, coming, just cruising through there and you arrive and are like, “whoa.” Very impressive. So, let's zoom in to this woman. I arrived and I crossed that bridge and I arrived in the pasture. This woman brought me apples. This is a Poplar forest that was grown by, you know, ancestors of this woman here. If you zoom in a bit more, this is what they are doing. They go there, most in winter, mostly to cut wood. They are cutting this sea buckthorn that grows very quickly and they have a rotating system within the community. So it's sustainable and it can regrow. And these grandmas they go around, you know, these older ladies or younger ladies, whatever they go in the pasture to cut wood every day. They walk about two hours round-trip to bring back and they use it they need that wood for cooking and for heating the house. The sea buckthorn has these berries on it that are easily gathered in winter when the berry are frozen. Because in summer if you take them, they break. The skin is too thin. Great heart tonic and lower cholesterol. You know, they eat that all the time there. The women also bring back hay for the animals, to feed the cows. These women go out every day and they are just having a blast. They are laughing all the time, talking all the time they really look forward to these outings. They are going to walk away from the men, walk away from the village and gossip all they want. They got this funny guy walking around following them. We had a blast that day. It was really just a fantastic, you know... Just really great. It is work but to them it's just... they do that every day. Soon enough I get invited right and left into houses. Great atmosphere, very tight family bonds in North Pakistan. This woman is preparing flat bread, chapati. And they do all kind of different variation of that around chapati, with this flat bread. It's the main thing. It's grown always locally. On the upper left it's called Chap churo, layers of flat bread it's a bit like a pancake with diluted milk and apricot oil. There's buckwheat on the upper right with mulberry syrup. And then apricot down there. There's places where I went where there was no real dinner. The act of eating wasn't a ritualistic kind of... experience. But in North Pakistan, it's really people gather round. There's usually one common plate, so you reach out together into one plate. It's a very important moment to get together. Apricot is very important. They make this-- Apparently pasta came from that part of the world from Western China, not too far away. They roll out this chapati very thin and then cut it in slices, and make pasta, and then mix it with dried apricot from the summer. They dry a lot of their fruits and vegetables so that they can keep all year round. And they mix it together with the pasta, the apricot and get this quite delicious dish. 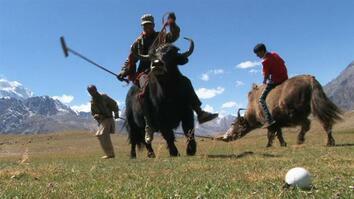 Rarely do people hunt there because they are herders as well. But some time ducks that fly over from Siberia to India get stranded in valleys and then they cook them. This guy Yahyah Naig on the right has been hunting the whole day to get this duck. Their tractor is the bull, they use manure for fertilizer. In every duration, whether it is peace, whether it is trouble, whether it is earthquake, whether it is something calamity. So, Inshallah the world will come very peaceful and we shall be one. And because the world is becoming now a universal village, a global village. Being a teacher I have been teaching my students to be to be very, very, very cooperative and think about universality. So that we can live together peacefully. Just a little talk with your average, you know, farmer. It happens a lot in Pakistan and I love it. But this is part of my, you know, excitement of being a photographer.